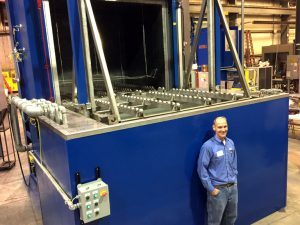 Derrick Company now offers Solution-Treatment, Aging, Stress Relief, Annealing & Other Heat Treatments on Aluminum Alloys. Increase production with precision results. For Aluminum Alloy Heat Treatment Temper Designations, click here. Derrick Company is a recognized and trusted name in the heat treating industry. Family owned and operated, we’ve been the reliable resource for consistent quality, with focused and personalized service for five generations. We are extremely proud to now offer aluminum heat treating to existing and new customers across the country. Contact us now to discuss your aluminum heat treating needs.